Texting behind the wheel is so dangerous it can impair a driver’s response time by 18% – or the time it takes to miss a stop sign, run an intersection, and broadside a family. increase their risk of accident or other negative outcome. With LIVE simulators, Chad will engage the audience as your student body takes on the task of trying to text and drive. consequences of texting while driving, become passionate about preventing distracted driving, and be enabled to stand up to those who are texting while driving. They will understand the consequences of texting while driving and how a split-second decision could change their lives. student can pledge to take a stand against distracted driving. 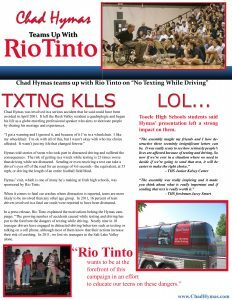 The banner will remain at your school as a reminder of Chad’s powerful message and the students’ pledge to not text while driving. Chad will also offer students silicone thumb rings they can wear to remind them of the “No Texting While Driving” message.